Trying a new ingredient or a new formula excites me. If I find a new method or a new ingredient to make my daily bread the next morning, I go to sleep with a smile the night before. 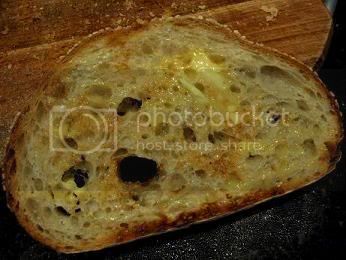 I read about the Chia seed in one of Johnny's comments on Sourdough Companion a long while ago and had tried Chia seeds with other grains and seeds several times but never on its own. I was happy with the results each time but never stopped to think why the results were good; I just moved on. I looked upon the Chia seed the same as any other grains and seeds. It just so happened that last week I ran out of all the grains and seeds, except the Chia seeds. It was 10 days before my family were due to travel again and I was trying to run the fridge down and not to bake any more bread before we leave - the freezer was already chuck full of sourdoughs to bring away with us. But, I got excited over questions like: what would it be like to have Chia seeds, and Chia seeds alone, in my sourdough? and what would Chia seeds do to my daily bread? You cannot believe how moist the crumb was. It was so incredible. This moisture is completely different from that in a super-high hydration loaf like Ciabatta which, in my experience, if not finished within a couple of days, turns as dry and tough, and as quickly, as anything I can think of. 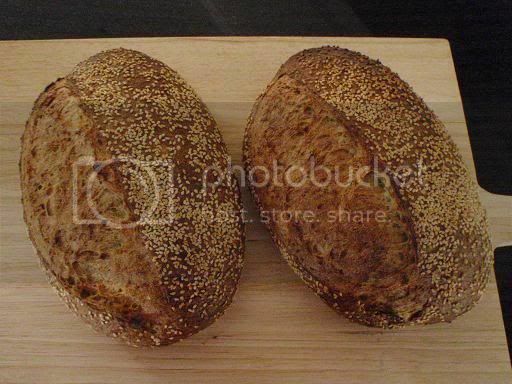 But it is similar to Hamelman's Five-Grain Levain, because of flaxseed, one of the five grains used in that bread. I have found that flaxseed, once soaked, has a similar gel-like property like Chia. (2) Texture: The gelatinous, glue-like substance seems to have also altered the texture of the bread, resulting in softer crumb. In this regard, I think it is important not to over-hydrate the dough, otherwise you may lose the springiness and chewiness, typical of sourdough bread. I have also tried soaking the Chia seeds with six times their weight in water, while maintaining my other bakers percentages, and the result was very gummy crumb, most unpleasant to have. 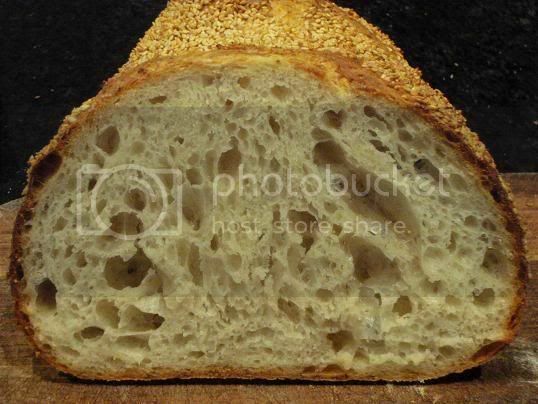 The article mentioned above says that 8 parts water to one part Chia can be added to bread dough, but I think this would work only if you add a couple of tablespoons, not more, as was suggested and beautifully done by Sharon, the glutenfreesourdoughbaker, here. (3) Taste: This may sound strange, but I have noticed my wholemeal sourdough now tastes sweeter than before. For people who don't like 100% whole wheat, Chia gel is like a "tonic" that would modify the bitterness in 100% whole wheat bread. We know most kids choose white bread over whole wheat bread because of the high fiber and bitter taste in whole wheat flour. Well, I've got news. I gave my kids and their friend a 100% wholemeal sourdough (with 7% Chia), they thought it tasted like a white sourdough and between the three of them they finished a 750g loaf! ** Dough hydration was 72% (not taking into account the Chia and the boiling water to soak it). You may want to adjust hydration to suit your flour. Total dough weight was 1.1 kg. *** Dough hydration was 80% (not taking into account the Chia and the boiling water to soak it). My wholemeal flour is a high gluten flour which is very thirsty for water. Adjust hydration if your WW flour is not as thirsty as mine. Total dough weight was 1.57kg. Following were my steps that produced the breads pictured in this post. You can use your own dough process. One thing of note is that my white Chia sourdough had a total of 6 1/2 hours fermentation before overnight proof-retarding, while my WW sourdough had 6 hours all-up and that was too much. I overlooked the fact that there was more pre-fermented flour and the fact that wholemeal flour (especially the organic version I used) has more enzyme and ferments faster than plain white flour. As a result, my whole wheat Chia sourdough had less oven spring and less volume. (1) Pour the boiling water over the Chia seeds. Stir and set aside the Chia gel to cool. (2) Dilute starter by adding the lukewarm water a little bit at a time until all is added. (4) Knead the dough by way of stretching and folding it in the bowl, about 25 strokes (for the white one) or 20 strokes (for the WW sourdough). Cover. Rest for 30 minutes or longer until the dough is completely relaxed and extended. (6) Lightly oil your bowl and place the dough back, right side up. More dough strength develops if the dough rests right side up. Give it 30 - 45 minutes rest until it is relaxed and extended again. (7) Turn the dough over and gently stretch it to as far as it can go between two hands without tearing it. Fold 1/3 from one end to the centre and 1/3 from the other end to the centre, the same way as you would fold a letter; then, from the other direction, fold the dough again like a letter. Place the dough back to the bowl, right side up. Rest for another 45 minutes or for as long as it takes for the dough to relax. (8) Another double letter-folds. Rest. Repeat the folds and the rest, if your dough needs it. (9) Pre-shape and shape the dough. By the time I finished shaping the dough into a batard, it was six hours from the time my dough was first mixed. The temperature of my shaped dough had come down to 19 - 20 C. If your dough &/or room temperatures is higher, shorten the fermentation time accordingly. (11) The next morning, my dough had nearly doubled in size in the fridge. (12) I pre-heated my oven to as high as it could go for over an hour. 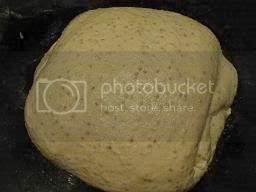 (13) I sprayed the top of the dough with water (if you don't have a spray bottle, you can use a damp towel), then sprinkled lots and lots of sesame on the top. (14) I poured 1/4 cup boiling water onto the lava stones sitting in a roasting pan underneath my baking stone. Then, I slashed my batard and peeled it onto the banking stone. I poured a cupful of boiling water over the lava stones. (15) Immediately I turned the oven down to 230 C and baked for 25 minutes, then I turned the oven down to 220 C for another 25 minutes baking. (16) Rest the loaf for an hour before slicing. 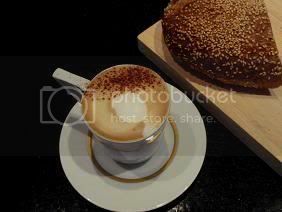 We know that toasting a slice of dry bread temporarily gelatinizes the starch and makes the crumb crunchy and edible. But try toasting a moist bread, Wow! The soft crispiness you get from Chia sourdough is amazing. Welcome back, wonderful breads, least to say. Glad to have you contribute to TFL again! What a gorgeous loaf and photos! I just want to take a big bite of that buttery toast. Thank you for sharing your information and recipe! 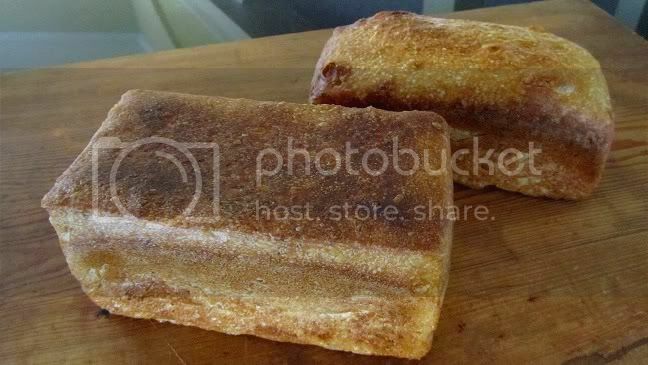 Beautiful bread and splendid write-up, Shiao-Ping! I love what soaked flaxseeds do in bread to the texture, but also the flavor. I didn't get a sense of whether chia seeds have a distinctive flavor. I am very, very new to sour dough recipes, being mostly use to yeasts and quick breads. However, I do use Chia Seeds in a good deal of my cooking from home made yoghurts all the way through to yeast breads. The difference is when you talk about hydration levels in your starters, what do you mean? and do you have to use a whole meal starter? as of this stage I have only tried a white flour starter. I would be very interested in you input. your bread and the information you have provide is wonderful. Thank you, all, for your warm remarks. In a way, these little seeds puffed up in lots of water remind me of sago (see here), both having the ability of absorbing lots of water. Hi Country Girl, you certainly don't need a whole wheat starter to make this bread; in fact, any starter, any recipe, you have is fine. Just add any where from 2% to 7% bakers percentage in Chia (and 3 to 4 times the weight of Chia) to any recipe you have. I used a whole wheat starter because that was what I had at the time; i.e., instead of white flour, I had whole wheat flour in there, and for 100 water I had 100 flour, making the hyrdation ratio 100%. Great post, and lovely to see your bread back on the pages of TFL too. Daisy_A and I have been comparing notes on chia seeds. I couldn't find them in any shop in Newcastle city centre. Both of us found them on the internet, available mail order for around £20/kilo. Seems a trifle expensive, so I'll stick with golden flax for now, and hope to find a cheaper source soon. Chia gel is a popular technique with some of our gluten free experts on TFL too. I have seen your posts here and there, for some time. 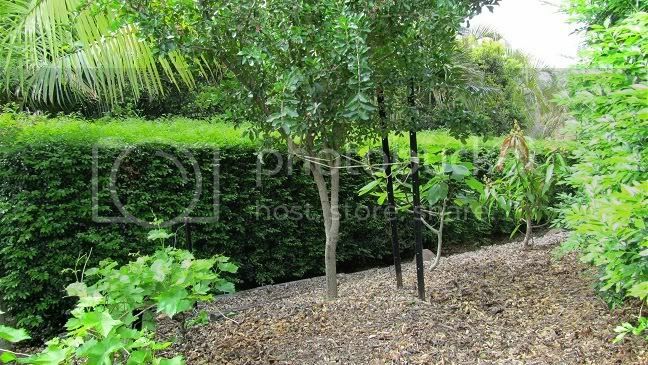 Wow for that price, I might plant some in the garden! Anyone know the "Futures" price on chia? It's a bit cheaper in Australia (A$28 for a kg, about GBP 16). I started with a small quantity (at 50 grams, it is A$1.40 and about GBP 0.80). I heard from my mother-in-law recently that the supermarket 'Foodland' in South Australia is apparently going to be adding Chia seeds to their stock line. This might bring the price down a little. I usually get mine in 500g bags from the Health food at about $16.95Aus, but because I'm a member I get a further 20% off so keep your eyes open, in the organic sections of your supermarkets. Thank you Shaio-Ping for your help with my sour dough query. Thanks for a most informative post, Shiao-Ping! I'd be curious to try your recipe. I'll check and see if my local health food store carries the seeds. Meanwhile I hope you and your family have a great vacation! Thank you for the holiday wishes. Singapore is a fast moving country, a lovely place to visit every now and then. But the best part is family and friends gathering. Mmmmm those breads look very nice. What exactly are Chia seeds? Never heard about them. some information about Chia seeds here: http://www.living-foods.com/articles/chia.html . I have been making sourdough Chia sandwich bread using the formula in the post (I cut down the hot water for soaking the Chia seeds to 3 times the Chia weight). For the bread above I used the dough function of my bread machine for mixing (5 minutes in slow gear in total). I hadn't used my bread machine for ages and I had forgotten how easy and hassle free it was to make sourdough bread with a bread machine. 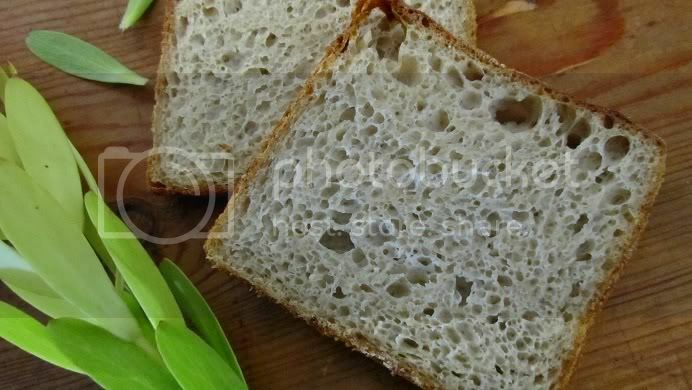 The Chia sourdough sandwich bread stays fresh for a lot longer than normal sourdough bread. So far every Chia sourdough I made has been beautiful, but I still couldn't decide whether or not the Chia has added extra flavour to the sourdough. 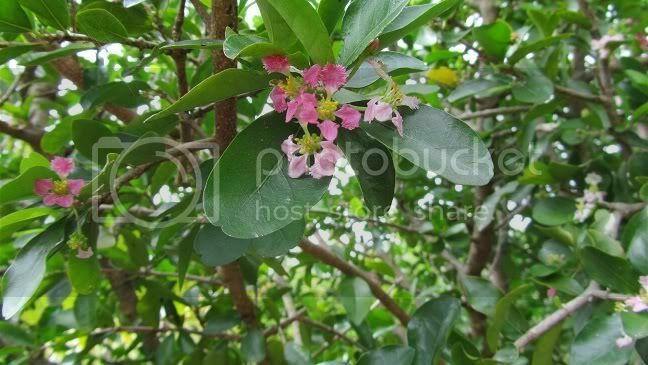 Hi Shiao-Ping, Great post again.Well done and thankyou for sharing. I had never heard of chia seeds until the Bakers Delight bread chain started promoting it a few months back. I googled it and yes it as good for your health as they say. My reply to you is not about the chia seed but to say thankyou for telling us fellow Australians about Laucke's "Wallaby" bakers flour. I finally bit the bullett and bought a 5 kilo bag(a lot of flour for us) with a strong sealed plastic container. What an improvement in the texture and flavour of the bread I now produce. As previously mentioned I only used Laucke's pre mixed bread flours. Now that I use their bakers flour my loaves(in all humility LOL) have taken a step up, have risen to the challenge and sprung to the occassion. I'm even astounded that my scoring just before baking now looks good. 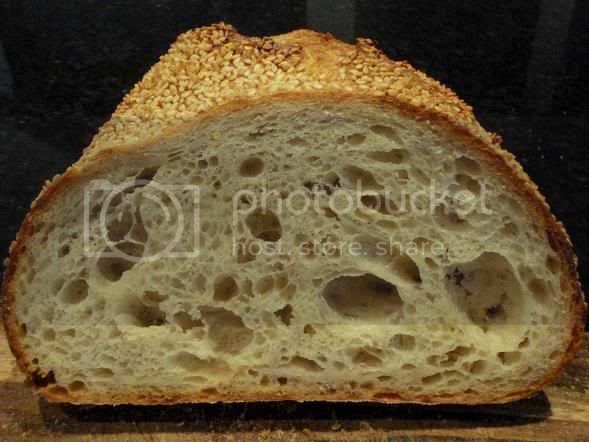 The gluten developement as the bread is kneaded has a totally different feel and look about it. It is just so different in flavour, crumb texture,the crust and oven spring. As much as I like and trust the Laucke brand name I will find it hard to go back to their pre mix bread flours. I guess they are good for someone who wants to start out on in learning home making bread as they produce a lovely loaf. But the Bakers flour will now be my future. Thankyou again for putting me onto this. After seeing it for so long and being unsure becuase of the volume of flour I will find it hard to go back to a pre mix again. I too have noticed at my local Bakers' Delight store that they now have Chia bread, wholemeal as well as white; and I must admit that I actually don't mind it, especially the wholemeal version, really lovely for sandwiches. It's funny how we are put off buying something because of its volume. Five kilo realy isn't very much once you start baking regularly. I have not been baking very much lately and my starter has been dormant in the fridge for two to three weeks at a stretch each time, and each time I brought it out of the fridge I would bake continuously for 3 to 4 days, each day 2 Chia sandwich loaves at a time. My family has been enjoying these sourdough Chia sandwich bread. Every morning my son has two slices with Vegemite Cheesybite or peanut paste, and my daughter will have hers with avocado or honey. And, my husband will have his with a sunny-side-up. 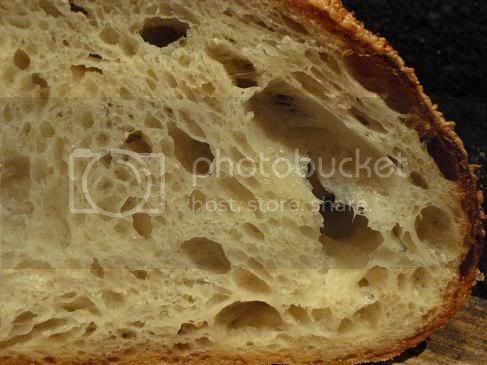 I am surprised how fast I go through a 5 kilo Laucke's "Wallaby" bakers flour! Yes B/Delight did a big TV ad promotion a few months ago. I bought one loaf and said yes I can do that. I've just got to find the chia seeds. My family is now off my hands but we remain very close in spirit and heart. As it is only my wife and I the need for large flour quantities for the last 5 years have not been required. I don't bake bread as often as I use to as I have lost 54 kilos in wieght(thats 126lbs for the Americans) and I find bread really fills me up very quickly and I can only eat in very small limited quanities. But the experience of putting a good loaf together is most relaxing for me. When I bake bread now I will quite often bake 2 medium loaves and 5 lunch buns for my wife to freeze and use to take to work. Even then the 2nd loaf will be given away most of the time to our neighbour or mother because I don't eat it quick enough. I will bake extra when the son comes back home to send him back with some. A lot of enjoyment in giving away something that you make that others will enjoy. 54 kilos... that's most amazing. I guess you are more discerning what you put into you these days... and what great choice Chia seeds are! I worked chia seeds into my favorite rye! I added 50g seeds and 100g water and added about 30 minutes baking time. It's cooling as I write. I wanted to bind up moisture so that the dough would be dryer and easier to handle, and it worked. At least I thought so. The idea of the seeds then giving up the moisture during the bake is what I was after and I will soon find out more. I got a good hard dark crust with a few georgous cracks. I think you are truly on to something here with raising the hydration and keeping dough tension using chia seeds. I put in an apple strudel in the oven when the bread came out. I can't begin to describe how delicious my house aromiates. My apples were not very sour but I had a few small stalks of rhubarb (late planted, not bluming yet) from the garden to cut small and mix in. I will have to remember that tip. ...If you can imagine just falling backwards, slow motion, being engulfed in apple pie, on a warm sunny nuty Autumn day, you might come close. Don't think about the mess, just think slowly... a r o m a t h e r a p y. ... what I would like to know! The apple and rhubarb strudel sounds fabulous. I bought for my son and my husband a chia sandwich bread from my local bakery yesterday. Their chia seeds are crunchy to bite into, quite nice actually. I thought to myself next time when I make my chia sourdough, I should try using less water to soak the seeds. You used two times water. That is a good idea. Would love to see pics of your strudel and chia rye! Found that the chia loaf moist inside. Before it had completely cooled, the crust had softened up, much like it does overnight in a plastic bag. This morning after the night in a bag, the flavors have blended, the seeds give it a interesting chewiness. I didn't notice any crunch. The loaf does seem heavier and I can slice the bread thinner. Could it be more flexible? I didn't get more rise out of the loaf than normal, but I was also a little scared to try. I did get some oven spring. I was a little worried about the sprouted flour (with its additional enzymes) giving me a shorter fermenting/proofing times. I didn't soak the seeds but threw them into the sourdough & water spice mixture stirring well before adding flour. (See THIS post.) Is there a seed texture difference in the final bread? I added the extra water after mixing in the flour and seeing it was too dry. That would mean the seeds and their gel coatings were already surrounded by flour. The extra water would go directly to the rye flour that hadn't been moistened. It might work differently if the extra water is added to the seeds first, the seeds grabbing up all the water. Interesting thought or not worth mentioning? 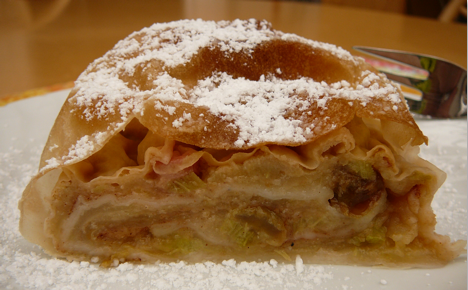 One picture of strudel for you, the last piece. We are getting snow in the Alps today so I dusted the strudel too! Yes, Mini, I think it is important to mention that chia will grab water faster than flour. I did notice last night when I was reading your chia rye bread formula that you added your chia early in the cycle and that you added more water right at the very end for your rye flour. Lovely strudel. Getting snow in the Alps? Sounds really exotic. We are having sure signs of spring down under. 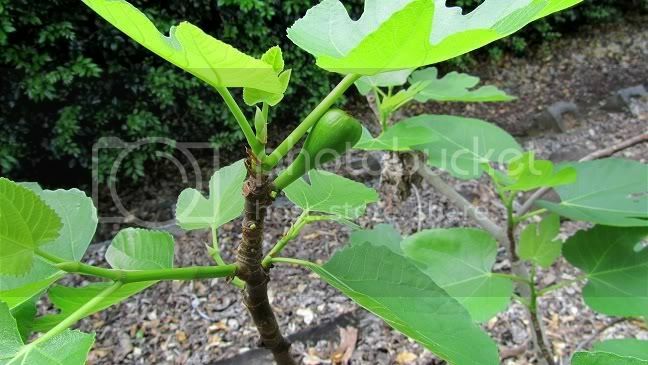 Fruit trees that I planted three years ago are finally giving me hope of an exciting season coming up. My first ever fig! Promises? I know this blog is a couple years old , but I wanted to thank Shiao-Ping for such a detailed entry! Chia seeds are a lovely little seed, we use them in quite a few things here in Mexico. For once, an ingredient I WONT have trouble finding here! We have a flavored water even here made with chia seeds. I like them simply sprinkled on oatmeal or over a fresh fruit salad. Am adding this to my to do list , thank you again! Please don't ever add boiling water to chia seeds. You destroy their nutritional content immediately. They will hydrate quickly with room temperature water but you want to stir them a couple of times. By doing this and then adding them to the dough, most of the nutritional contect is saved as the bread is baking. However, by hydrating with boiled water you destroy everything.